Many mechanics turn to the same reliable work boots that many other workers wear. These can be great, safe option. But work boots are not the only options for people who work as auto mechanics. Auto mechanic shoes are a lightweight, less bulky alternative to safety work boots that offer the same protection for your foot. We’ve sorted through the top mechanic shoes and boots and spent hours researching their pros and cons. Here, you’ll find some of the best mechanic shoes that meet or exceed our criteria. This shoe offers all the quality features you’d expect in a good work boot for mechanics, without the bulkiness or high-top. It rises to the ankle area with an upper constructed of the high-quality leather Timberland is known for. The design of the shoe is athletic-style, but it has a safety toe and electrical hazard protection. The rubber-constructed outsole of the Timberland PRO Men’s 40008 Mudsill Low Steel-Toe Lace-Up Shoes has strong lugs that improve your grip in the shop. The outsole is also slip-resistant, oil-resistant, and abrasion-resistant. It features an abrasion-resistant steel toe to help protect your foot from blisters, especially during the break-in period. The shoe also features shock diffusion, which absorbs the energy from your footfalls and minimizes impact, while providing an energy return for effortless movement. Inside the shoe, a PRO 24/7 Comfort Suspension System stabilizes your foot and reduces fatigue with every step. 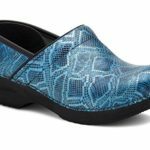 A molded EVA midsole adds cushioning and arch support to the shoe, while an anti-microbial mesh lining increases comfort and fights against odors that are common in work shoes. Over time, the shoe will start to break down. The area that will go first is the heel for some people, which is problematic because the lining can wear down your socks and cause blisters. They are also not waterproof, though this is not a deal-breaker if you work in an indoor shop where water is not a problem. As one of the most popular models in the Timberland PRO line, the Timberland PRO Pitboss Steel Toe Work Boot is ideal for mechanics who work on their feet all day. 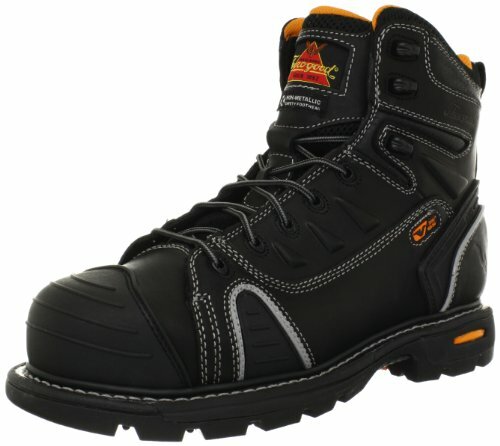 The steel toe meets safety standards, and the rubber outsole is slip-resistant, oil-resistant, and puncture-resistant. This boot stands up to the rough conditions of your job, keeping you safe from slips, falls, and falling objects. Measuring 5.5” from the arch, the Pitboss provides ample foot and ankle support to prevent injury. Mechanics have a rough job, on their feet and bending down for long hours. 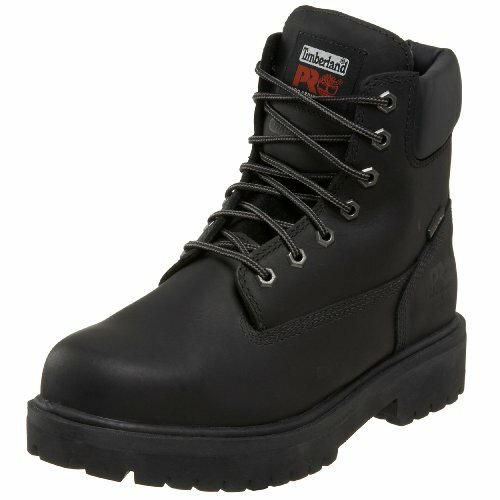 The Pitboss is not only one of the best safety boots on the market, but it is also the most comfortable. With a padded collar and a roomy toe bed, they fit your foot well without creating rubbing and blistering. For the hottest days, the breathable anti-microbial lining inside of the boot keeps your feet dry and combats odors. The PRO 24/7 Comfort Technology has shock absorption in the heel and the ball of the foot, giving you great arch support. A contoured insole with Anti-Fatigue Technology relieves foot fatigue so that your feet won’t ache after a long day at work. Although the Pitboss has the anti-microbial lining to keep your feet dry, the boot itself is not waterproof. They aren’t meant for extremely wet conditions, but they hold up against splashes and spills. For those who are tough on their boots, they will usually last for about a year of continuous wear. Although the boot doesn’t last much longer than a year, its comfort and protection will make the Timberland PRO Steel Toe Pitboss Work Boot your new favorite footwear. Unlike traditional work boots, these shoes have a mesh and leather upper that is designed to keep the shoe lightweight and breathable without sacrificing durability and protection. These are great all-around safety shoes, being resistant to acids and alkali substances, as well as oils. 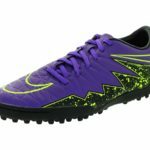 These shoes are also slip-resistant and puncture-resistant because of the traction on the outsole and the steel shank that runs through the length of the shoe. 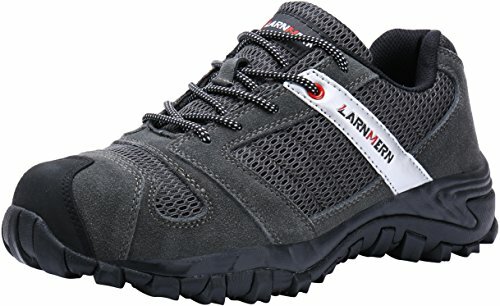 Inside the LARNMERN Work Shoes for Men LM-18 Men’s Steel Toe Safety Shoes, a Thicken insole adds comfort and breathability to the shoe, which stops your feet from sweating during a long workday. There is also protection with anti-smashing toe technology, which uses a steel material for the protection you need in the average auto mechanic shop. The outsole of these shoes grips the ground well, so you don’t have to worry about slips while on the job. The rubber material also absorbs impact well. This allows redistribution of the shock when you move around, stopping it from impacting your joints and feet. These shoes are not a good fit for outdoor work since they are not waterproof. If you get them too wet, they may break down over time. Another problem is the softness in the heel area of the shoe. 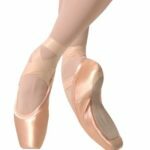 Its flexibility makes it cradle your foot while wearing and prevents blisters. However, the softness also makes the shoe incredibly difficult to pull on and off. 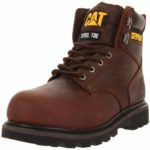 Perhaps more familiar as a heavy machinery company, Caterpillar has ventured into producing safety footwear that stands up to the worst work conditions. 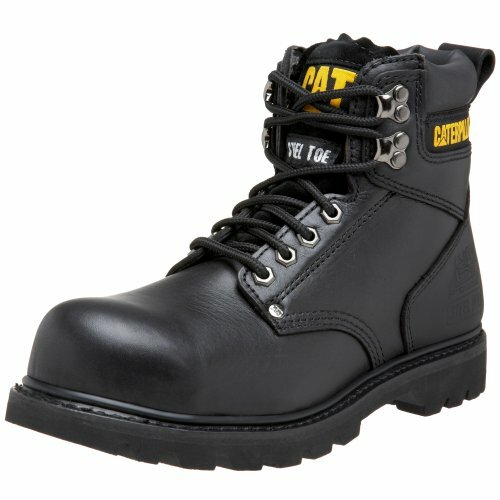 Mechanics favor the Caterpillar Men’s Second Shift Steel Toe Work Boot because of their durable build. With a full grain leather upper, it has overlays over the side and heel for a more long-lasting boot. The Goodyear welt rubber outsole is slip-resistant and oil-resistant, ideal for mechanics who work on vehicles and machines all day. An ASTM-certified steel toe keeps your toes safe from falling objects. The Second Shift’s ¾” platform and 1.5” heel have shock absorption, diffusing impact off of the heel and the ball of the foot. With a supportive build, the padded ankle collar and a removable insole reduce rubbing and keep your feet comfortable all day. The moderately priced Caterpillar Second Shift has metal-reinforced lace grommets and lace hooks, so they last longer than traditional hooks. There is a mild-break in period for the leather upper to stretch, but this is a relatively quick process. As you walk and bend down at work, the leather will begin to break in to make the boot more flexible to your movements. The Second Shift does run large, so you may need to order a size down for a snugger fit. The boot begins to fall apart after about a year, with the stitching along the upper failing and the outsole separating from the upper. However, these boots are so comfortable you won’t mind investing in another pair. The upper of this shoe for mechanics combines FlyKnit and cotton for incredible breathability and flexibility. 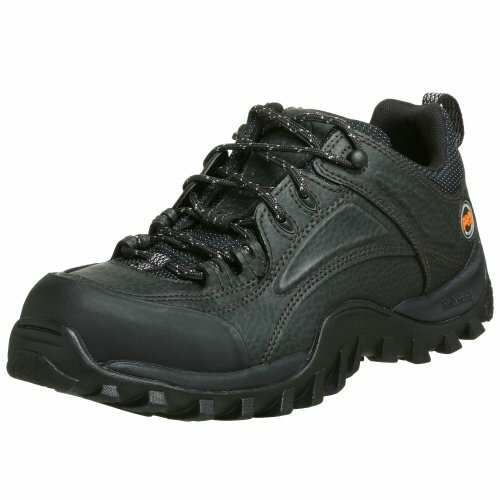 It features a European-standard steel toe for protection in the workplace. Though it is minimal in safety features, it is high in comfort. 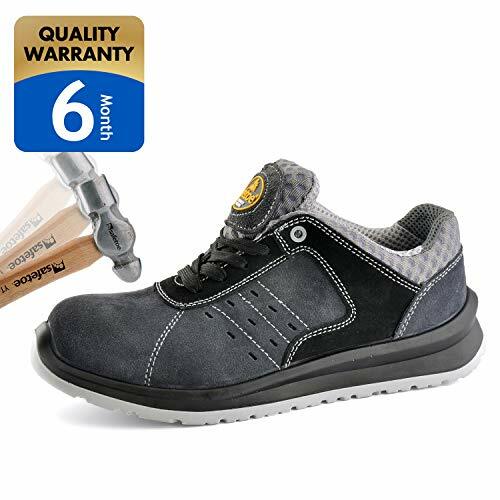 These shoes are a good choice for mechanics that work in slightly less hazardous environments or those who want a shoe that they can go from work to play in. MODYF Steel Toe Work Safety Shoes Reflective Casual Breathable Outdoor Footwear has a rubber outsole. Above this, a shock-absorber midsole eliminates the reverb from impact and stops your feet from feeling worn at the end of a workday. The tread has great grip, so you don’t have to worry about sliding around the workshop. The inside of this shoe features a removable EVA insole, which is intended to add breathability to the shoe and keep your feet dry. If you do not like it, you can easily tear it out and add your own insoles. There is also good support from the insole, midsole, and outsole of this shoe. Though the revolutionary FlyKnit-cotton blend is incredibly comfortable, it does not offer much support and protection for the top of your foot. The fabric used also stains easily, so you should choose a darker color if you frequently have your feet near various substances like oil when at work. Timberland built its reputation on its original 6” work boot, and the Timberland PRO Direct Attach 6” Steel Toe Waterproof Insulated Boot improves upon the initial design. Manufactured with more foot protection, the boot has a sealed waterproof and insulated leather upper that keeps your feet warm and dry. Measuring 6” from the arch, the Direct Attach supports your whole foot and ankle. The oil-resistant rubber outsole has excellent traction, protecting you from slips and falls at work. An ASTM-certified steel toe and metal-reinforced grommets follow safety regulations and provide long-lasting wear. A nylon shock diffusion plate in the midsole keeps you steady on your feet, with sturdy support along the most sensitive parts of your feet. The 1.75” heel and 0.75” platform also diffuse impact away from your feet. Designed for long days in hot environments, the Direct Attach has a mesh liner along the interior of the boot to help your feet breathe. A polyurethane footbed gives even more support when standing, bending, and walking. The mesh liner and the insole are antimicrobial to prevent foot odors. Although the Direct Attach is waterproof, it isn’t completely submergible. Your feet will get wet if you step into large and deep puddles, but they can handle the normal spills and splashes that you encounter at work. The polyurethane insole and nylon shank make the boot more rigid, so it doesn’t have great arch support. If you need more cushion, placing a custom insert inside the boot can help make you more comfortable. The Direct Attach runs small and narrow, so you’ll need to order a size or two up if you plan on using an insert. There is a mild break-in period of about a week for the leather to bend to your movements. If you work in really rough conditions, the boots will last you about a year. Although they run high on the price point, the Timberland PRO Direct Attach has the protection your feet and ankles need during your mechanic work. The upper of this mechanic shoe is made of genuine leather for a solid, durable build. It resists all types of weather, which makes it good for indoor or outdoor work. The upper also has mesh holes to increase the breathability of the shoe. As an added benefit, the shoe comes in wide-width to provide foot protection for the mechanic with wide feet. 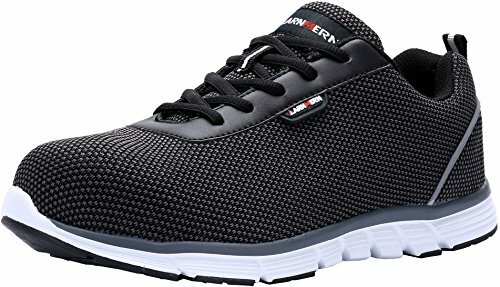 Inside the SAFETOE Men’s Work Safety Shoes Lightweight Sport Industrial and Construction Composite Toe Work Shoes, a shock absorption insole reduces foot fatigue. Additionally, a superior comfort in-sock helps hold your foot in place. A polyurethane outsole uses double-density construction, letting the shoe absorb impact. It also protects from electric discharge. A 3E+ composite toe cap offers protection on top of your foot. Underneath, a midsole plate stops nails and other objects from penetrating the bottom of your foot. The outsole also grips the floor well in most shops and has a flexible design. The leather of the upper can be a little stiff, especially before you break them in. There is also a break-in period for the insole, but it will conform to your foot with time. Finally, the shoe is built a little on the heavy side, especially for a work shoe. 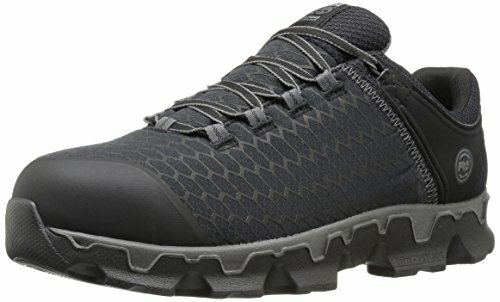 KEEN Utility is a unique manufacturer of footwear that brings the comfort of hiking boots to the safety boots and shoes. 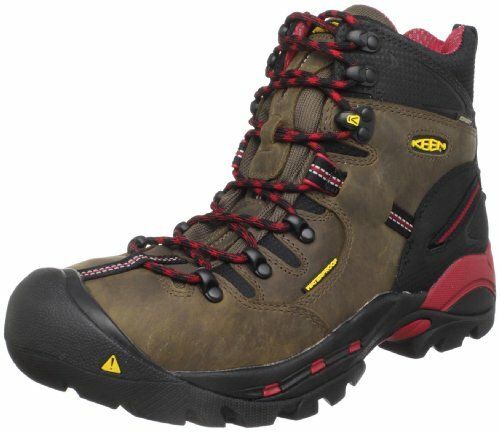 The KEEN Utility Men’s Pittsburgh Steel Toe Work Boot is a waterproof work boot that is best for mechanics who function in a supervisory role. With 100% Nubuck leather, the Pittsburgh has an ASTM-certified steel toe and a rubber toe guard for protection. The rubber outsole is oil-resistant and slip-resistant for safety. Including a roomy toe box, the interior of the boot has a breathable Dry-Lex interior lining to keep your feet from overheating. KEEN Utility’s Pittsburgh Boot has an EVA memory foam midsole and insole with a contoured heel. This anti-fatigue technology with extra arch and heel support is ideal supports your whole foot for long days on your feet. 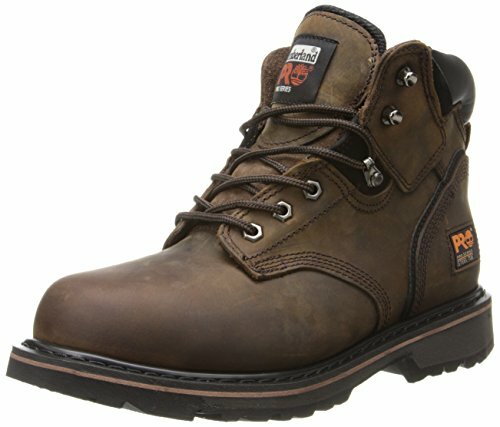 The Pittsburgh is comfortable like a hiking boot, but it protects your feet from the dangers of the job. The KEEN Utility Pittsburgh Steel Toe Work Boot is a medium-duty work boot, so it won’t hold up to the messy daily duties of mechanics who have to get their hands dirty. Although the soles have excellent traction, they have softer soles that deteriorate quickly on uneven or rugged surfaces. They are best for walking on flat floors, such as cement. They do have flimsy lace hooks that can reduce the ankle support if they break, so use care when lacing your shoes. Although they are an expensive investment, the KEEN Utility Pittsburgh Steel Toe Work Boot is a comfortable and durable steel toe boot for men who work in administrative roles in mechanic shops. Since 1943, Thorogood and Weinbrenner have partnered to bring the most comfortable and long-lasting work boots to the public workforce. The Thorogood Men’s GEN-FLEX 6-Inch Lace-Toe Composite Work Boot has the comfort and protection you need during long days of operating and fixing heavy machinery. Electrical Hazard protection and a composite safety toe meet ASTM standards. Lighter than a steel toe, the composite material doesn’t sacrifice the protection you need. On the 100% full grain leather upper, abrasion-resistant toe and side bumpers guard the parts of the boot that are most vulnerable to damage. The Gen Flex supports your entire foot throughout the workday. The flexible and durable Gen Flex II Goodyear storm welt rubber outsole has excellent traction on slippery surfaces. With superior shock absorption, the boot has a 1” platform, a 1.5” heel, and a compression-molded EVA memory foam midsole with gel support. The removable EVA memory foam insole cushions your foot when you walk, stand, or bend. To keep you stable on your feet, the Gen Flex has a composite shank in the midsole and an anti-heel roll bar. The Thorogood Gen Flex runs wide, so you may have to order a size down if you have narrow feet. There is a lengthy break-in period for the leather to stretch, but extra bending can help this process along. During this period, the boots can feel heavy, despite not having a steel toe. Although there is a mesh liner inside of the boot, the boots still do not breathe well. If you work in extremely harsh conditions, they will last about a year before they start to fall apart. The bumpers will fall off, and the sole separates from the upper. If you need a boot that offers good foot and ankle support, then the moderately-priced Thorogood Men’s GEN-FLEX 6-Inch Lace-Toe Composite Work Boot would be an ideal mechanic boot. The upper’s construction features frosted cowhide, which is soft, but tough. The materials also deliver on durability and breathability. Though it does not have a composite or safety toe, it does have a sturdy toe cap that can protect from stubbing your toe in the workplace. The materials are made using a seamless glue bond and a nylon stitching for increased durability. 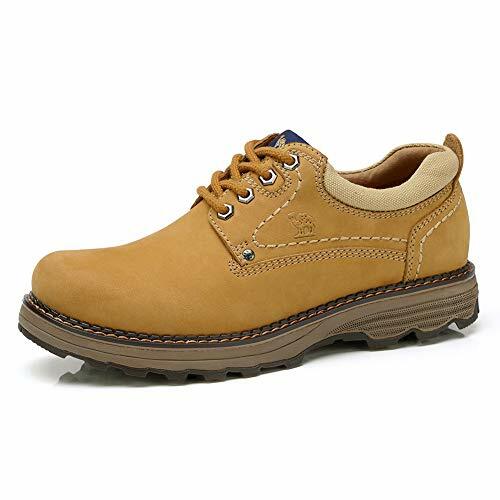 The thick tread of the Camel Crown Men’s Uniform Work Boots Lightweight Work Shoes Casual Off-Road Cowboy Shoes stop you from sliding around on the floor of the shop. Additionally, the material used is waterproof, helps prevent sweating, and increases breathability. Inside the shoe, the midsole is made of a natural latex material that reduces impact felt through the shoe. There is a rear heel biplane that stops your insole from sliding around, while a thin layer of pigskin massages the foot to reduce fatigue. The toe cap is also roomy, which is great for providing stability when you are on your feet. They won’t be practical in all workplaces because of the lack of a safety toe, but they can be a good fit for mechanics that don’t find themselves under heavy machinery. Additionally, they are tight at first but will stretch a little with time. 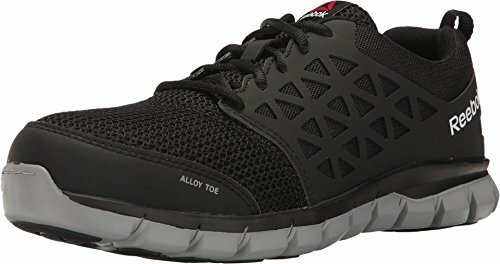 This shoe features great all-around protection. The design of the upper is unique, which is great when you want your shoe to stand out, with ripstop nylon and abrasion-resistant screen print. An alloy safety toe protects the top of your feet at work and the construction of the upper creates breathability through the shoe. Inside the Timberland PRO Men’s PowerTrain Sport Alloy Toe EH Industrial & Construction Shoe there is a fiberglass shank that adds structural support to stop your foot from rolling over. A mesh lining is treated with antimicrobial materials to control odor. The outsole is heat-resistant up to 248 degrees and is oil- and abrasion-resistant. It is made of a dual-density polyurethane material that absorbs shock. It has a unique tread pattern that makes it easy to move. The shoe also features Anti-Fatigue Technology that returns energy when you take steps to reduce fatigue that you feel at the end of a long workday. Though the alloy toe cap provides good protection, the fabric on the outside will wear down with scuffing and it may become exposed over time. The insole may also break down with time, but it can easily be replaced. 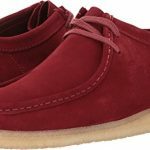 The upper of the shoe is made of synthetic and breathable materials. A webbing on the outside of the shoe provides support where you need it most to help prevent injuries in the workplace. Additionally, the mesh stops your foot from becoming too hot when you are at work. Inside the Reebok Work Men’s Sublite Cushion Work Industrial and Construction Shoe, there are plenty of features for comfort. A MemoryTech Massage footbed cushions the contours of your feet and provides unique arch support, while a Sublite foam midsole adds soft support and cushioning. The synthetic outsole features rubber heel and forefoot padding to give you comfort in high-impact areas. It has electrical hazard protection and also has an alloy safety toe that meets safety standards. Full-foot flex grooves give you the flexibility, so the shoe moves with your foot. The overall design is incredibly lightweight. This shoe lacks arch support, but you can order half a size up and add insoles if necessarily. The stitching near the top of the shoe could also be sturdier, especially since that is where the alloy toe is housed and it is a high impact area. We’ve focused mainly on the needs of auto mechanics. Although mechanics work in a variety of different fields, the protection that you need in your work shoes are usually the same. A quality shoe should be slip-resistant, oil-resistant, and offer protection from hazards. According to OSHA regulations, the best mechanic footwear should protect your feet from falling objects (like wrenches and machine or car parts), punctures, and dangerous spills. They will have a safety toe and electrical hazard protection. Finally, you also want them to offer enough support and comfort that your feet are not tired by the end of the day. Selecting a quality work boot for any profession can be a daunting task, but it is even more so with mechanics. The average mechanic faces a lot of hazards in the workplace. While some will be unique to your job, most workplaces require shoes or safety boots that offer toe protection and slip-resistance. Other factors like being oil-resistant will help your shoe withstand the average auto mechanics work environment. As you choose footwear, be sure that it meets the demands of your employer, so you stay protected on the job. Hopefully, the best mechanic shoes and boots reviewed above will help you choose the perfect pair.